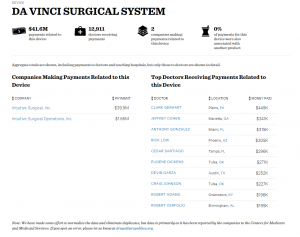 Doctors Paid by Drug Companies? Every so often a friend will make a post on Facebook about “Big Pharma”. I don’t think it’s as simple as “drug companies are the bad guys”. Modern drugs can improve the quality of life or even save lives. Are some drugs over-prescribed? Sure. But is that the fault of the drug companies or the doctors? 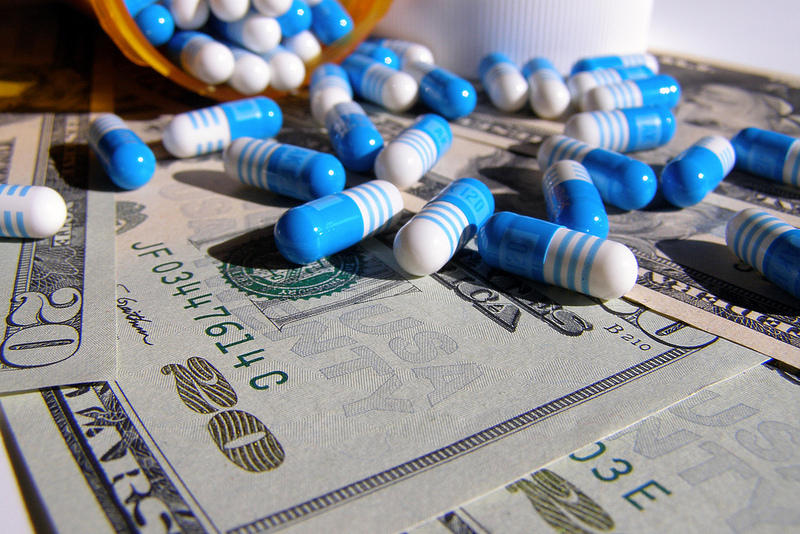 The drug companies spend money to get their products in front of the doctors. This may mean paying $15 for lunch while the sales rep talks to the doctor or it may mean paying several thousand as an “honorarium” (a payment given for professional services that are rendered nominally without charge). Could they be more vague? It could be legit, but it sure sounds sketchy. How do you know if your doctor is recommending a drug because you genuinely need it and it is the best choice for your condition or if they are recommending it because that drug company has been especially generous to them? 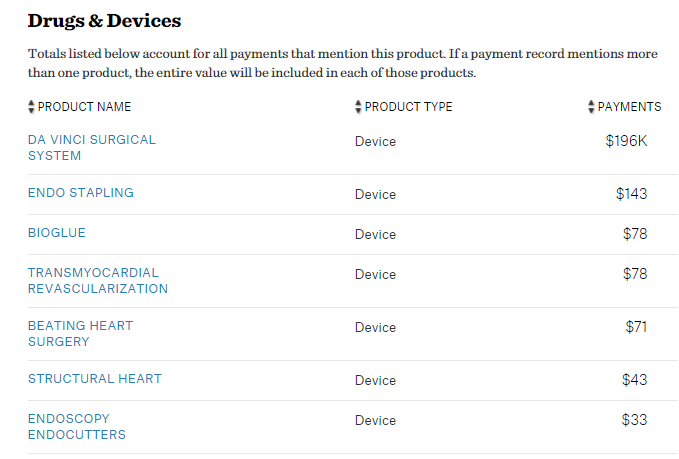 ProPublica Dollars for Docs lets you look up the payments that have been made by drug companies to your doctor. You can search by the doctor’s name or type in the name of your city and see a listing of all the doctors. I did a search by state. Most of the doctors received fairly small amounts, generally described as “food and beverages”. Probably a snack tray and bottled juice or soft drinks for the staff. But one on the first page stood out. He received almost $200,000 between August 2013 and December 2014. Wow. Nice job if you can get it. Clicking on the name of that generous company shows a list of who they’ve paid. You can also do a search for a specific drug company. Let’s see what Pfizer has been paying for. Lots for research given to universities, but I’m curious what “consulting” consists of. Is it in depth or is it just feedback from doctors on how the drugs are working? 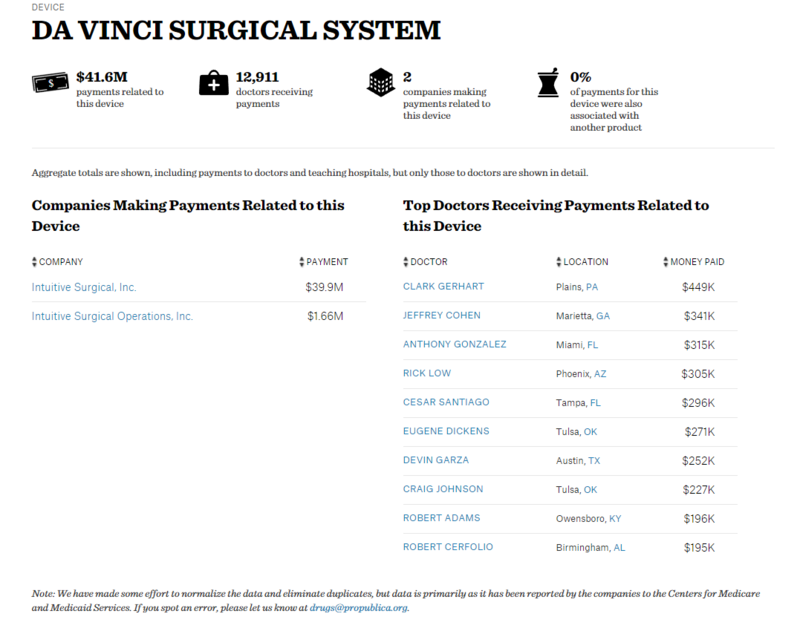 You can refine your search, so since the company spent a lot in California, I searched that state for doctors that received money for consulting. Whatever it is, it must be extremely helpful. 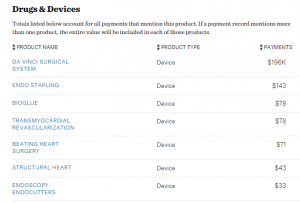 The site also lets you check Medicare providers. You can also search by drug name and see the number of Medicare claims by doctors. If granny needs her Oxy, you’ll know where to go. The US government also has a website where you can search for this information, Open Payment Data. Unsurprisingly, I found this site to be much less user-friendly than the ProPublica one. Previous PostTop Pop Songs of 2015?Next PostMiddle Ages’ elements in Shrek?